A Legal Requirement: Grease trap cleaning is actually a requirement in most municipalities and by the board of health. Good For The Environment: By having your grease trap cleaned regularly, it helps keep the sewer system clean and functional. In addition, professional grease trap cleaners know the best way to legally dispose of the grease waste to be the most beneficial for the environment. When to Clean Your Grease Trap: You can tell when your grease trap needs to be cleaned by simply looking at the amount. If the grease trap is half full of grease or you can smell it, it’s time to be pumped. Never One and Done: The frequency of cleaning depends on the use of the grease trap and the amount of grease that builds up within the trap. Typically, the local municipality will determine the compliance standards and time frame of grease trap cleaning. The Dangers Of Avoiding Grease Trap Cleaning: Without proper grease trap maintenance, your system can be at risk of clogging or overflowing causing other damages to your establishment. It’s Affordable: The investment is worth the peace of mind knowing that your grease trap is compliant and properly working. 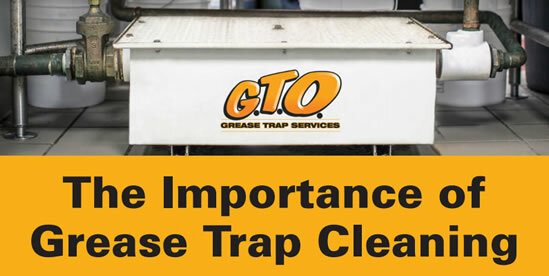 If you would like to learn more about how GTO Grease Trap Services can help your business maintain clean, compliant and environmentally conscious grease traps, visit our website at www.gtoservices.biz or call 800-723-1770.